Explanation: The space station has caught a dragon. 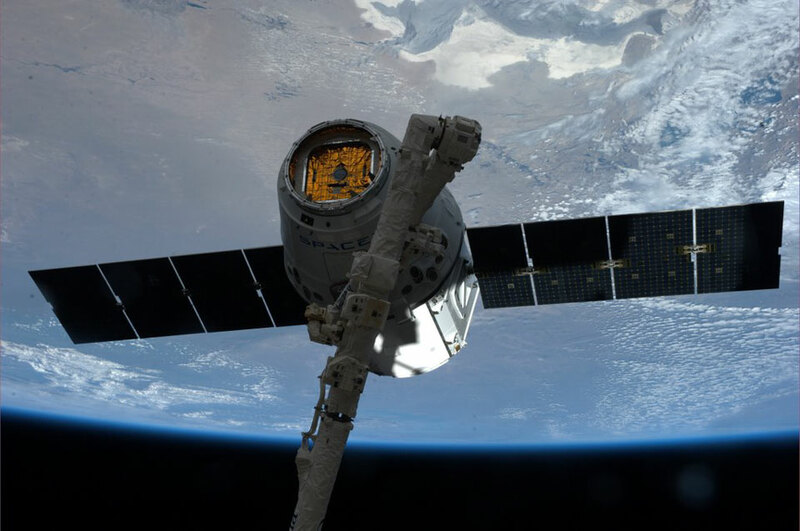 Specifically, in mid-April, the International Space Station captured the unmanned SpaceX Dragon capsule sent to resupply the orbiting outpost. Pictured above, the station's Canadarm2 had just grabbed the commercial spaceship. The Dragon capsule was filled with over 5000 lbs (2260 kilos) of supplies and experiments to be used by the current band of six ISS astronauts who compose Expedition 39, as well as the six astronauts who compose Expedition 40. After docking with the ISS, the Dragon capsule was unloaded and eventually released, splashing down in the Pacific Ocean on May 18. The current Expedition 40 crew, now complete, will apply themselves to many tasks including the deployment of the Napor-mini RSA experiment which will use phased array radar and a small optical telescope to monitor possible emergency situations on the Earth below.